A while ago I wrote a small library for the RN-42 Bluetooth module. This small module acted as a serial port when connected to the Netduino. 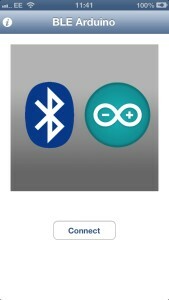 Times have moved on with Bluetooth 4.0 being available on the iPhone I thought I would take another look at Bluetooth. The Bluetooth module we will be using is the RedBear Bluetooth Mini. This little module is a Bluetooth 4.0 Low Energy (BLE) module. In it’s simplest form it offers the ability to act as a serial port for your project. This is how we will be using this module for this project. To test this a BLE compatible device is required. 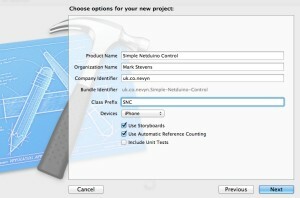 Enter the iPhone 5 and the BLE Arduino application which RedBear have thoughtfully provided. The application may be written for Arduino but it is sending simple serial commands to the Arduino. Let’s see what it is doing and if we can use this application. My guess is that this is setting up the Arduino serial port to run at 57,600 baud using standard data bits, parity and top bit settings. Time to break out the logic analyser. Additionally, the logic analyser is connected to the Rx and Tx pins of the Netduino. An Async Serial analyser was added to the two pins through the Saleae software. This analyser has an Autobaud feature. Turn this on just in case we get the baud rate incorrect. Press the Click button to connect to the ReadBear module. Select the Arduino to connect to. The Arduino Uno has a similar pin out so select the Uno option. A quick check in the Async Serial analysers properties shows that the data logic analyser thinks that the data is being sent at 60,000 baud, pretty close to the 57,600 which was found in the code earlier. Pressing the H at the side of Pin 2 in the application generates the sequence 144 4 0. Following this up by pressing the H at the side of Pin 3 results in the sequence 144 12 0. Checking the Arduino code shows that the digital commands are prefixed by 0x90, i.e. 144. 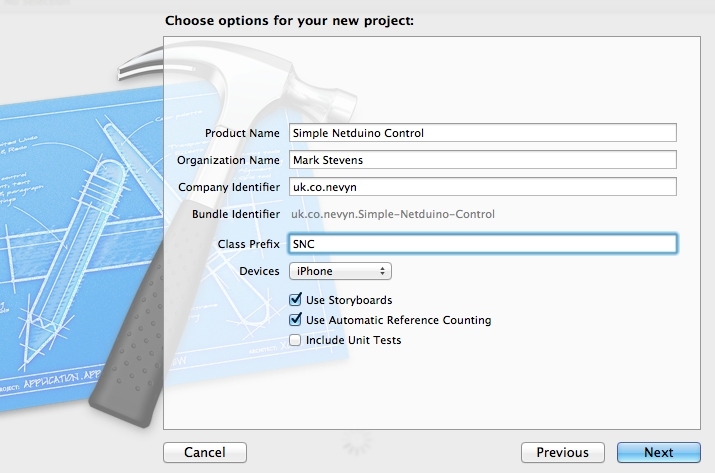 Now that we know the iPhone and the Netduino can communicate (at least from the phone to the Netduino) let’s have a look at creating our own iPhone application. 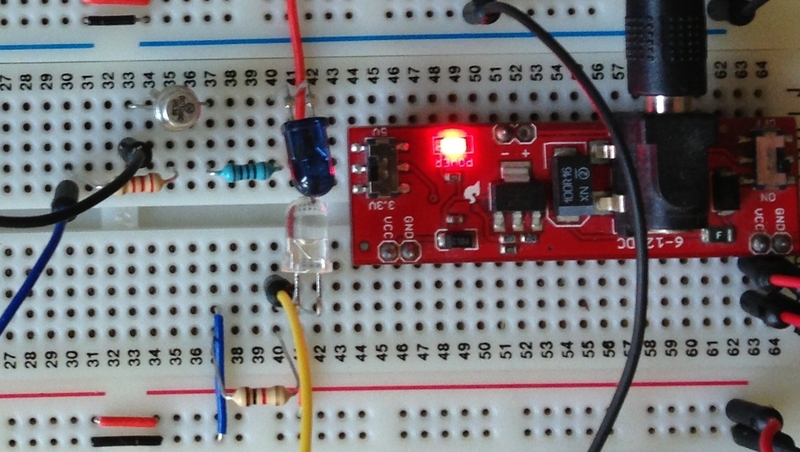 The simplest application would entail toggling a digital pin, so let’s do that. We’ll turn an LED on and off. Next we need to add the CoreBluetooth.Framework references to the application. So scroll down the frameworks and click on the + button under the Linked Frameworks section. 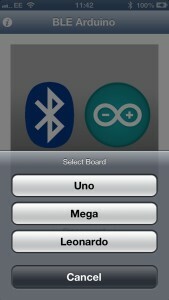 Type bluetooth in order to search the installed frameworks. Next, we need to add the RedBear BLE framework. I downloaded this and put it in my stored libraries. 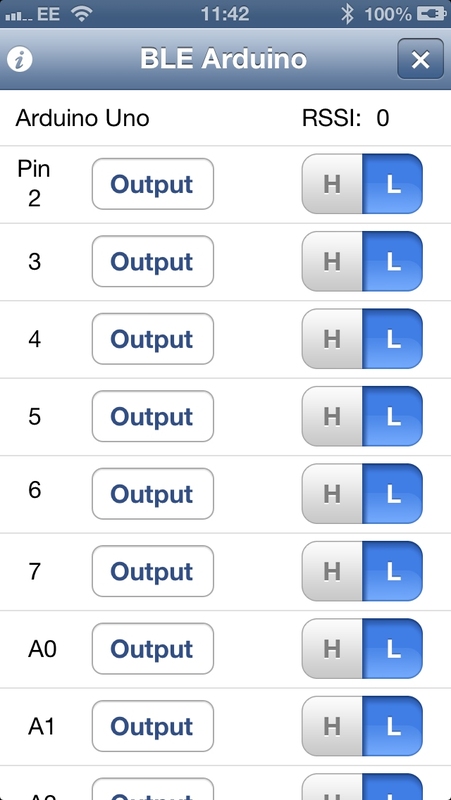 This was then added by right clicking on the Frameworks folder of the project, selecting Add Files to… and then browsing to the folder which contained the files. btnConnectToNetduino Button to connect/disconnect to/from the Netduino. lblStatus Label to indicate the status of the application. swLED Switch which is used to turn the LED on/off. 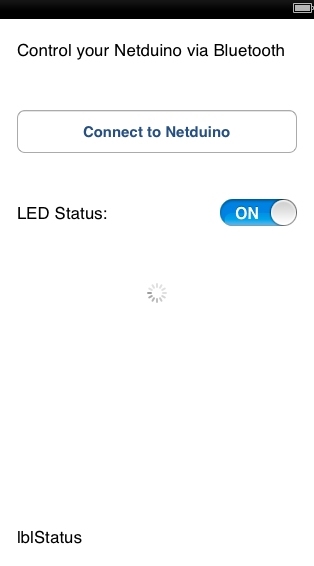 aiBusy Indicator which shows when the application is trying to detect the Bluetooth module. //  Define the various modes for the state machine. Now we have the controls defined in the header file we can start to work on the methods. These definitions create the Bluetooth object and he variables required for state control. These methods are generated by default when the application is first created. For viewDidLoad we will set up the application for initial use. We will not be modifying the didReceiveMemoryWarning method in this application. //  Create the Bluetooth objects. //  Setp the simple properties. //  Process the memory warning event. 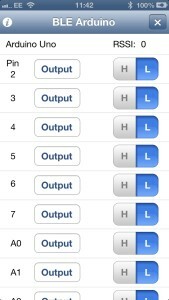 The main point to note in the viewDidLoad method is that the Bluetooth object is initialised. The btnConnect_TouchUpInside event initiates the connection/disconnection of the application to/from the Bluetooth module. //  User has pressed the Connect button so try to connect/disconnect from the Netduino. //  User has changed the value of the LED. //  Connected to a Bluetooth module successfully. //  Application has disconnected from a Bluetooth module. //  RSSI has been updated. First we connect to the module. Once connected we can start to turn the LED on and off using the iPhone. 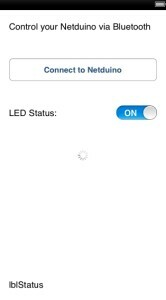 The library provided by RedBear is a great starting point for using the iPhone to communicate with a BLE module. It is simple and easy to use for this type of application. This whole experiment only took a few hours to put together an execute. In this post we will use Mr Maxwell’s new fangled electrons to generate invisible light and transmit a signal through the luminiferous aether. Or to put it another way, I’m learning how to use IR remote controls in microcontroller circuits. The problem with using infra-red LEDs is that you cannot really see if they are on or off. 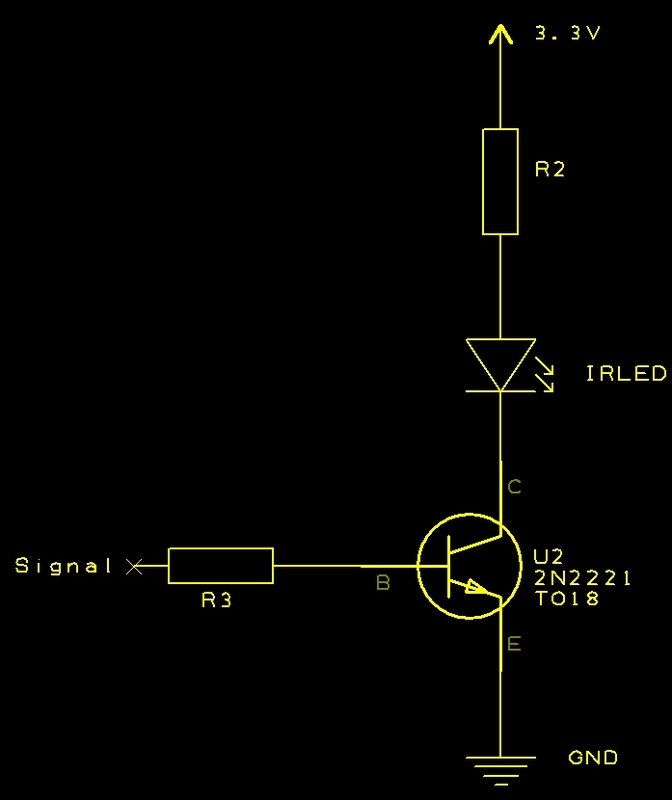 You can see if a signal is applied to the LED but this does not mean it’s generating an infra-red signal. Let’s admit it, we’ve all burnt out an LED or two in our time. 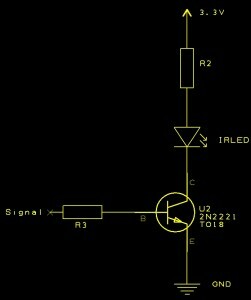 So in this post I’m going to put together a couple of circuits to generate and detect infra-red signals. 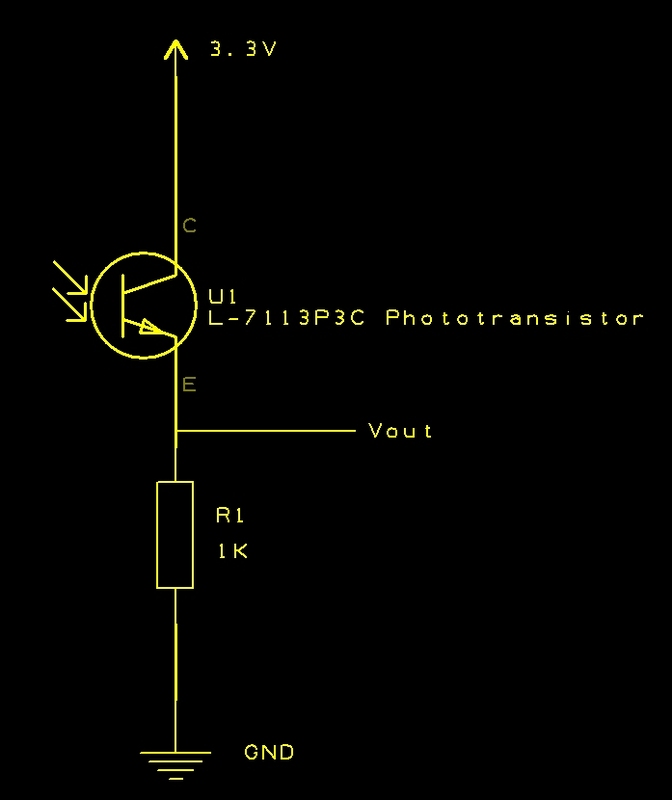 The phototransistor has two conventional connections which allow the collector and emitter to be connected to the electrical circuit but the third connector (the base) has been made sensitive to infra-red light and then exposed via a lens. 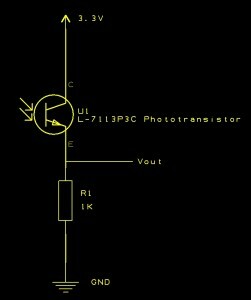 The transistor becomes conductive when infra-red light hits the photosensitive base of the transistor. Should be simple enough. Out comes the breadboard, oscilloscope and a couple of remote controls I have to hand. So, it looks like the detector circuit is detecting the infra-red signal from these remote controls. The top part of the breadboard contains the transmitter circuit (Blue LED) and the lower part of the breadboard contains the receiver. Looking good. The signals show a good match. 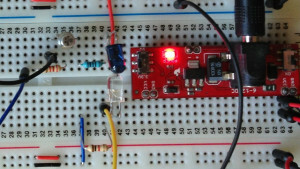 The main aim of this exercise was to create an infra-red receiver circuit which can be used to verify that an equivalent transmitter circuit is working. The receiver circuit gives a value for Vout of 3.12V. This is an acceptable value for logic 1 for the microcontrollers which I am using. Their nominal input value for logic 1 is the supply voltage +/- 0.3V. The transmitter circuit should allow the use of the same microcontroller to generate a signal which can be used to control a device such as a TV etc.